Standing 107 feet tall, Grays Harbor Lighthouse is the tallest lighthouse in Washington State and the 3rd tallest on the West Coast. Carl Leich, its architect, considered this to be his masterpiece and is the Pride of Westport, Washington and Grays Harbor County. Grays Harbor Lighthouse sits on Point Chehalis on the southern side of the entrance to Grays Harbor, Westport, Washington in the United States of America. There are 135 steps leading up to the lantern room. The original staircase is forged of cast-iron. The landing brackets are pieces of artwork themselves. They are mounted to the wall to support the landing, while the staircase is self supporting. The manufacturer of the metalwork was Patrick Dundon of San Francisco Boiler Works. 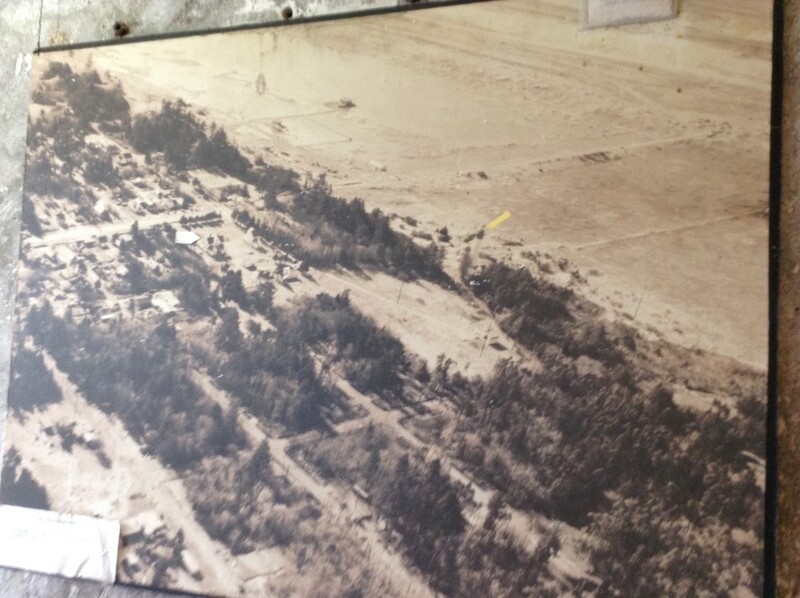 It was originally located approximately 400 feet from the water’s edge. But with the accretion of the beach, and in part, by the construction of the jetty system in the early 1900’s, it now sits about 3,000 feet from the high tide mark. It marks the entrance to Grays Harbor, the best of Washington’s few outer-coast harbors on the Pacific Ocean. In March of 2019 there was the successful passage of the Washington State Maritime Heritage Areas Act. 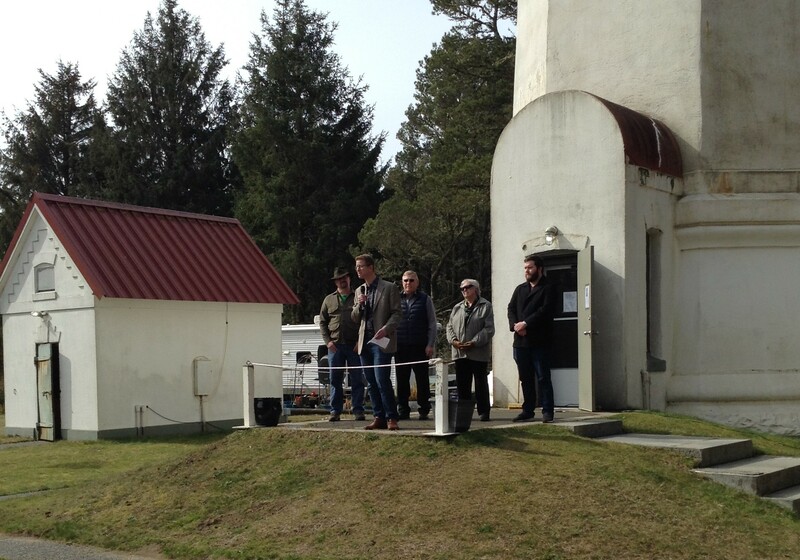 Congressman Derek Kilmer hosted a celebration at the Grays Harbor Lighthouse along with State Representative Brian Blake D- Aberdeen, Aberdeen Mayor Erik Larson and John Shaw the Director of the Westport South Beach Historical Society. 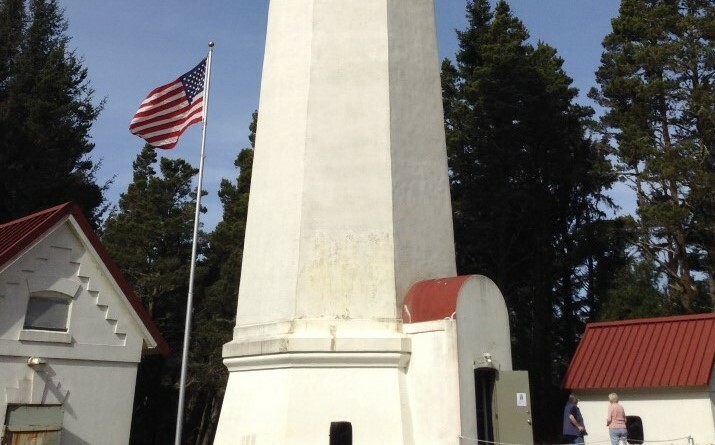 After the celebration John Shaw conducted a tour of the Grays Harbor Lighthouse. 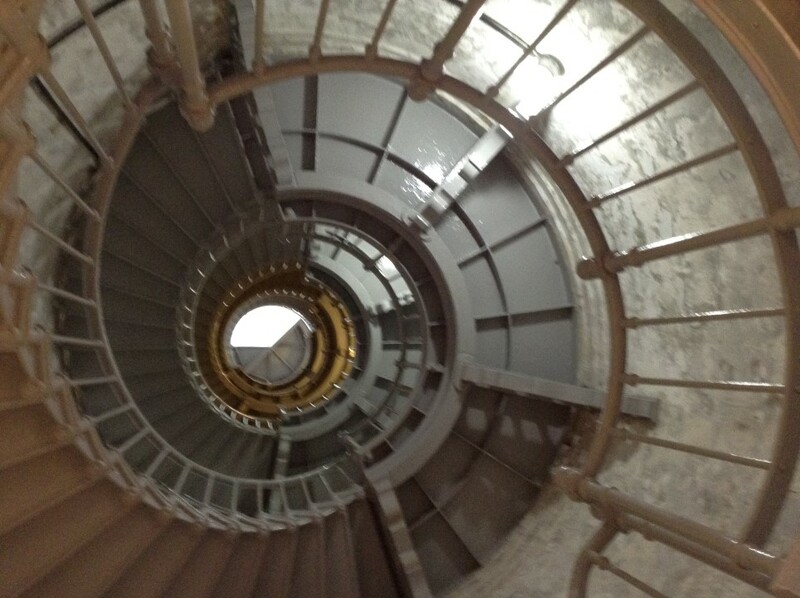 Attendees could climb the 135 stairs to the top. The passage of this act will create funding and grants for programs and activities of maritime history for tourism and public access. Construction of the lighthouse began in 1897 and was completed the following June of 1898. On June 30th 1898 a dedication ceremony was held at the base of the lighthouse and that night marked the first official service of Grays Harbor Lighthouse. The base of the lighthouse sits on a twelve foot thick foundation of sandstone. The walls at the base of this octagonal structure are four feet thick, tapering up to an 18 inch width. Internally they are made up of red brick, with concrete on both the inside and outside. A metal structure completes the top of the tower. Besides the lighthouse, the original station was also equipped with an attached workroom, a windmill, a water tank, a well, two keeper’s dwellings, two oil houses, a fog signal building, two outhouses, a barn and a tool room. The entire cost of construction was $56,000. Today, all that remains is the tower and two oil houses. Reconstruction of the work room and the fog signal building are planned for the future. Operation of the fog signal averaged about 500 hours a year, or six percent of the time, but in 1905 it logged 881 hours. Around sixty-seven tons of coal was consumed to produce steam for the fog signal. It took approximately 200 pounds of coal to produce one hour worth of steam for the fog signal. Windows originally provided light for the interior during the early years, but when the station was converted to electricity they were cemented over to reduce maintenance. Unlike many of the lighthouses of today, The Grays Harbor Lighthouse still houses the original 3rd order clam shell-shaped Fresnel Lens, which was built in Paris, France in 1895. 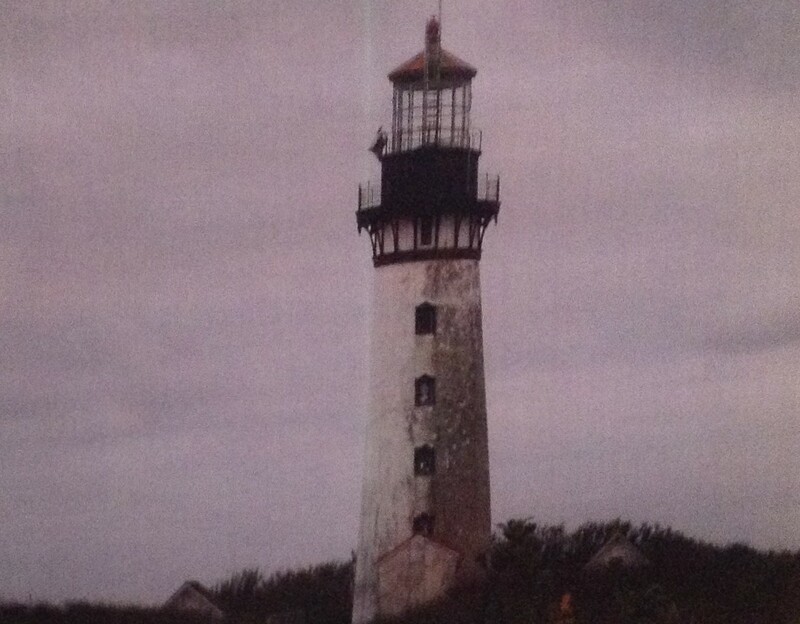 The lighthouse’s initial signature beacon was a five-second white flash, then a five-second red flash, but after electricity reached the lighthouse, the signature became white flashes followed by 15 seconds of darkness, then red flashes followed by 15 seconds of darkness. In August of 1992 the original 3rd Fresnel lens was turned off and replaced with a smaller light which is mounted to the balcony. The new smaller light was manufactured in New Zealand. The new light operates on a 35 watt bulb and can be seen for 19 miles with the white sector and 17 miles on the red sector. Health concerns arose over the mercury-filled drum which was used to float the Fresnel Lens. This set up had provided frictionless movement and allowed the lens to be rotated by a weight which hung inside the tower. But in the 1990's it was closed to the public becasue of the mercury. In 1998 the Westport-South Beach Historical Society negotiate a lease agreement with the Coast Guard to clean up the tower. When the building was deemed safe in 2001, the public tours resumed. In 2004 the Westport-South Beach Historical Society was granted ownership under the National Historic Lighthouse Preservation Act and the Grays Harbor Lighthouse enacted a five-year plan to restore the light house and its third-order Fresnel lens. Today, visitors can climb to the lens or Lantern room level. The flash pattern of the lens was, and still is, red and white to mark the opening to Grays Harbor. The lighthouse is still an aid to navigation and visitors are able to see the current beacon mounted to the outside railing. Once at the top, visitors can enjoy a 360 degree view of the ocean and it's surronding areas, a photographers dream. If there on a clear day you may get lucky enough to see the top of Mount Rainier to the east. 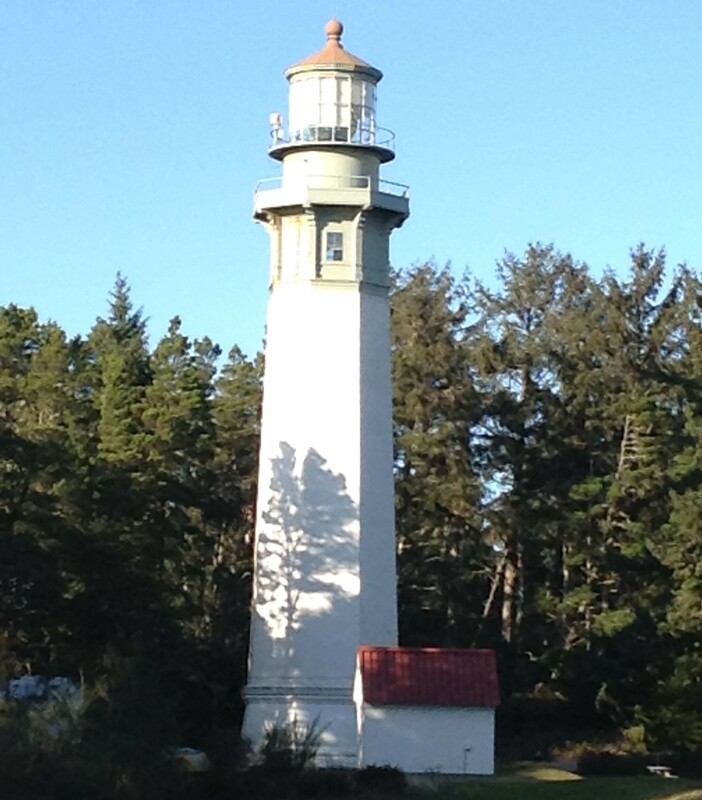 For pricing and tour times of Grays Harbor Lighthouse check with the Westport Maritime Museum.